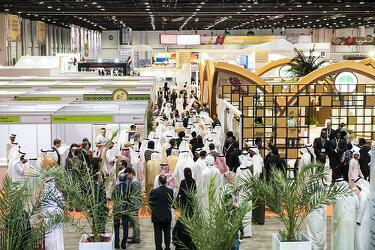 The ninth edition of SIAL Middle East, the fastest-growing food, beverage and hospitality event in the region, and the fourth edition of Abu Dhabi Date Palm Exhibition concluded today at the Abu Dhabi National Exhibition Centre, facilitating 135 trade deals valued over Dh7 billion ($1.9 billion) as initial outcomes during its three-day run. The event, held under the patronage of Sheikh Mansour bin Zayed Al Nahyan, Deputy Prime Minister and Minister of Presidential Affairs, and Chairman of the Abu Dhabi Food Control Authority (ADFCA) drew the participation of 1,089 exhibitors, 34 country and specialised pavilions, and 28,073 industry experts and unique visitors from more than 45 countries. On the final day, Abu Dhabi Food Control Authority (ADFCA) honoured several food establishments for their commitment to implementing Abu Dhabi’s food safety requirements as well as the organisers of Weqaya programme ran by Department of Health - Abu Dhabi. ADFCA also honoured a number of government entities that participated in the 9th edition of the event. Thamer Al Qasimi, the chairman of the SIAL Middle East 2018 Organising Committee, said: "The exceptional success of SIAL Middle East 2018 and the unprecedented visitor turnout demonstrates the continued regional and global interest in the mega event that serves as an ideal platform to explore the latest F&B products and services, and to discuss promising investment opportunities with leading specialists, top buyers and decision-makers." Al Qasimi said: "It is a top priority for SIAL Middle East to support the vitally important regional F&B sector in keeping pace with the latest industry trends, strategies and innovations to ensure the continued development of national food industries and enhance food security for the sake of current and future generations." The total food sales in the UAE in 2016 rose to Dh121 billion, with the country’s food consumption expected to increase from 48.1 million tonnes in 2016 to 59.2 million tonnes by 2025. Food exports to Abu Dhabi reached AED516 million in the first half of 2018, while its food imports stood at Dh3.3 billion. The total investment in food industry is set to increase from Dh5.2 billion to Dh10.4 billion over the coming three years, representing a 40 per cent growth. After three years, the investment is expected to increase by Dh1 billion, registering a 10 per cent growth. The event witnessed the announcement of Al Rawabi Diary Company, Munkyeong Omija Valley Co. Ltd and Philippines Department of Agriculture as the winners of SIAL Innovation contest. The winning products included Al Rawabi Diary Company’s Nutree Boost in gold category, Munkyeong Omija Valley’s OMI Everyday Concentrate & Extract Series in silver category and Philippines Department of Agriculture’s Instayum Mushroom Chips in bronze category. Visitors got to view the 30 most innovative food and beverage products out of 150+ submissions at the SIAL Innovation area. Al Qasimi also honored a number of Emirati social media influencers in recognition of their outstanding role in supporting and covering the event. They included Anas Al Hemeiri, Sabha Al Rumaithi and Khaled Al Sanani. SIAL Middle East 2018 featured a series of interactive sessions, seminars and workshops that drew the participation of leading local, regional and global experts. The attendees discussed the latest F&B trends as well as key issues related to food production and innovation to meet the region’s surging food needs, triggered by rapid economic and population growth.